NathanRising » Nathan loves his uncle! My brother was in town a couple of weeks ago! It’s always so nice to see him. I miss him terribly and he is definitely one of my “bestest” friends. Whenever he comes to Knoxville, which is about 3-4 times a year, he always makes time to see me and we’ll usually meet in Knoxville and hang out. This last time, we ate some sushi (first time eating it together! ), checked out some stuff at the mall, ate ice cream, and walked around a bookstore. Might not sound like much, but the whole time we’re together, we’re acting goofy and laughing like lunatics. In fact, we invariably get into laughing fits… he’ll start laughing at something, which makes me laugh, which makes him laugh harder, which then makes me delirious with laughter- can you see where this is going? We’ve both started drooling from laughing so hard! It’s always so awesome to spend time with him. And oh yeah, I got my hair cut! I felt like I really needed to change it up after having a baby, so I got it all cut off and I LOVE it. I’ll probably keep it short for a while and then I’ll grow it back out again at some point. So anyway, my brother really wanted to get Nathan something special while he was here, so he decided on a Build a Bear. Have you ever heard of Build a Bear? Well, it’s this neat little store where you can build your own bear (or any of the stuffed animals they offer) by picking an animal, stuffing it, and even adding accessories. He picked out the neatest, softest bear he saw and then had a recording put in the paw where every time Nathan pressed it, he would hear “Hi, Nathan! Uncle Paul loves you!” All their bears come with a heart, and you’re supposed to hold it between both hands, make a wish, and kiss it before they put it inside the bear and stuff it. Let me tell you, it was priceless watching my brother do that. He’s such an awesome uncle. My brother named the bear Benny, and Benny even has his own birth certificate and birthdate. 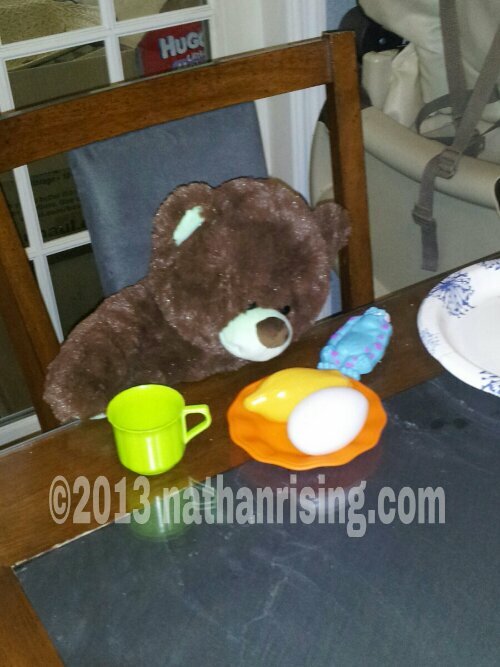 So then when we got back to my house, my brother presented the bear to Nathan, and he loved it! Nathan LOVED the recording my brother made, and pressed that paw so many times that the battery died within a week! Seriously. Nathan sleeps with the bear at night. All would be quiet, and then I’d hear the recording of my brother’s voice over and over again before Nathan drifted off to sleep. I’m glad it was my brother’s voice and not some pre-recorded mechanical voice. THAT would have driven me nuts. I bring Benny with me when it’s time to pick Nathan up from school. The very first thing Nathan asks for is Benny. And then he’d press that paw over and over again the whole ride home. When I warned him the battery would die, he then gave it about five seconds between every push of the bear’s paw. One day I walked into the kitchen to discover Benny sitting at the table with a “meal” made just for him from Nathan’s kitchen. Gosh I love that kid! 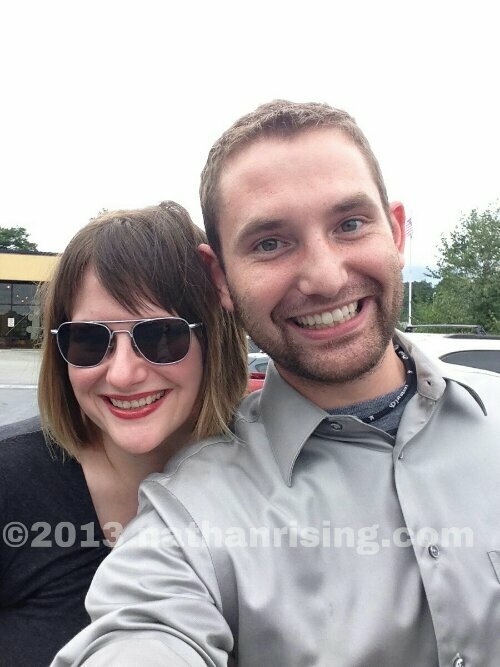 This entry was posted by Jen on September 3, 2013 at 1:04 pm, and is filed under Daily Life. Follow any responses to this post through RSS 2.0.You can skip to the end and leave a response. Pinging is currently not allowed.